Stearate, butter and leptin receptors: Speculation! I suppose the first thing I have to say is that the Tatter Paper of the last blog entry is not science in the form that any scientist might recognise. Control your variables is rule one... I only posted on it because, by a complete and apparently unplanned accident, the deep fried chips were of similar macros to the boiled mashed potatoes (BMP) but differed in fat type, in a manner very exciting from a Protons point of view. Just to emphasise: This was a chance gem in a pile of wallanga*. Picking the gem out of the wallanga can get your fingers dirty, but it's worth it. Chance is occasionally very useful. 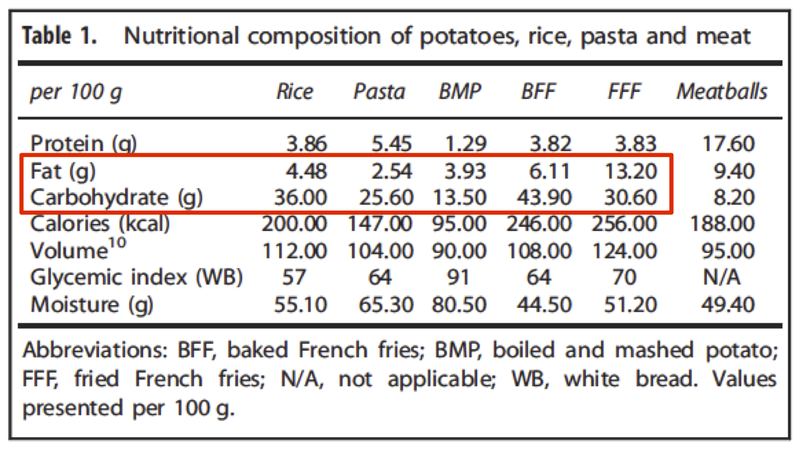 I also happened to notice that, again by chance, the BMP macros were going to pan out somewhere near 40% fat, using butter as the bulk calorie source. This too is quite exciting. The post before the Tatter Paper post was merely pointing out that control C57Bl/6 mice do NOT become obese on their high (40% of calories, chance, neat huh?) fat diet in Ms Reeves' PhD. Their weight might be a little heavier on an olive oil based diet with generous PUFA and a little lighter on a stearic acid based diet with minimal PUFA, but nothing dramatic and absolutely no obesity in sight. Not a perfect match but reasonable. Why is this interesting? My (repetitive) idea is that a certain amount of input to the ETC via ETFdh drives reverse electron flow through complex I to limit adipocyte distention. Stearic acid plus chow starch does this early during a meal. Butter plus potato starch does this early during a meal. Canola oil plus potato starch doesn't. We have no idea whether the butter with potato starch would carry on, long term, to a slim phenotype in people. The long term effect of stearate is downwards and of oleate/linoleate is upwards on bodyweight in mice, but the effect is small. How come? Anyone who has read Hyperlipid over the last few years will be well aware that I hate high level signalling. It usually takes a basic process, like the control of insulin signalling by the ratio of inputs at complex I, ETFdh and mtG3Pdh, and sticks a nice, glossy, superficial and somewhat opaque surface veneer over it. Then researchers can go off to find 25 or more genes which have some level of influence at some level of "higher-ness" of signalling above the core process. We then end up with a morass of over information with no one linking it all to the core process. Such a high level signalling molecule is leptin. I have had relatively little interest in leptin over the years so may well be missing large chunks of information which are common knowledge to others on tinternet. The basic process seems to be that fat cells make leptin and the hypothalamus uses the information embedded in blood leptin levels to make a ton of decisions about energy homeostasis and energy use. Including appetite. Leptin secretion is related to adipocyte size but deeply under pinning adipocyte size is the ETC's control of insulin signalling, which sets cellular fat content. Leptin appears to provide some long term modulation of a series of repeated short term post prandial insulin events. We can strip off the surface veneer of longer term leptin signalling from the core mitochondrial process by using db/db mice. The db/db mouse has non-functional leptin receptors. This means that the acute effect of mitochondrial signalling within adipocytes is not smoothed over or averaged out by the brain using leptin. The core process in fat cells takes over and can be seen via body weight and fat mass. At peak energy flux stearic acid generates the maximum resistance to insulin's distending effect on adipocytes. Oleic/linoleic is far less able to generate insulin resistance to limit calorie ingress to each adipocyte. The point of this post is emphasise that saturated fat, which I consider to drive physiological adipocyte insulin resistance, limits weight gain in leptin receptor KO mice. The fact it also cures their diabetes at the same time is another story. I consider that leptin smooths out the differences in fat storage produced by superoxide signalling originating from the ETC. I hate this, being a great fan of superoxide signalling. 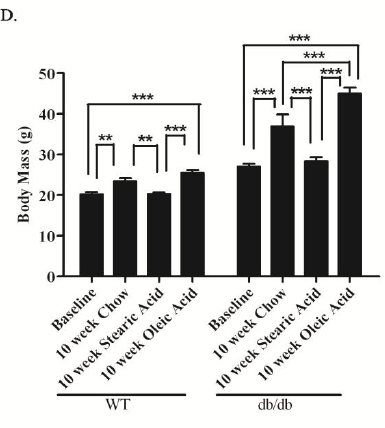 Stearate generated superoxide can largely offset the obesogenic effect of being a db/db mouse produced by the attendant lack of leptin signalling. 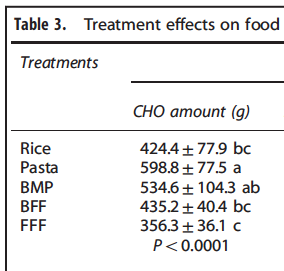 It works with stearate at 40% of the diet, but not at 17% (elsewhere in the PhD). 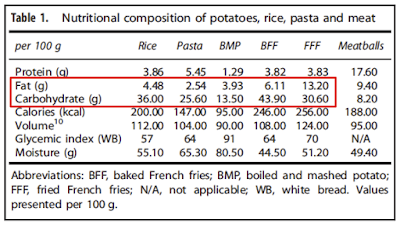 Could this combo of spuds (or any other starch), butter (38% of calories, quite similar to 40% of calories from stearate) and meatballs work for people who are db/db in the same way as the stearate diet works in db/db mice? Could the butter component of the "tatters" side-step failed leptin signalling (as in obesity) or relative/absolute hypoleptinaemia (as in the post-obese) in the same way that a ketogenic diet side steps the need for insulin signalling? A final comment on leptin. I'm unfamiliar with the massive complexity of leptin signalling. It seems to go on and on for ever. But just occasionally you come across little snippets of interest which suggest things about the function of leptin. There is a group who have developed an adipocyte specific leptin receptor knockout model. The only cells to lose their leptin receptors are the adipocytes. They still make leptin, they still release leptin, the liver still sees leptin, the hypothalamus still sees leptin. What happens? "Despite a normal level of leptin receptors in the hypothalamus and normal food intake, mutant mice developed increased adiposity, decreased body temperature, hyperinsulinemia, hypertriglyceridemia, impaired glucose tolerance and insulin sensitivity, as well as elevated hepatic and skeletal muscle triglyceride levels". The mice become obese and diabetic (on chow of course). Just by their adipocytes failing to perceive plasma leptin levels. And folks think the brain controls obesity! And of course you should be able to fix these adipocytes by supplying stearic acid as 40% of the diet. Aside: The brain is clearly important in controlling all sorts of physiology. No one would deny this. Much as the computer of a modern car closely controls engine performance (my sister used to drive a Mitsubishi Lancer Evolution which turned out to develop 270bhp on a rolling road. She'd paid for the 315bhp version. Mitsubishi took out the computer, sent it to Japan for upgrade, refitted it and, hey presto, 315bhp. Never touched the engine), so too does the brain fine tune metabolism. 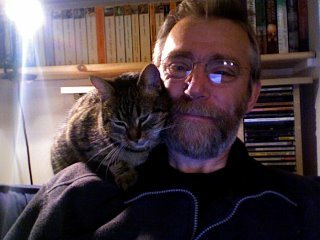 But if metabolism is broken peripherally there's not much point looking in the brain. Trying to upgrade the performance of a Morris Minor by reprogramming its computer would be technically slightly difficult. When I used to tune Morris Minor engines computers still ran on punched cards. But the core process in the engines of a Lancer and a Moggy are the same. End aside. So, did leptin arise to allow fat cells to monitor the fullness of other fat cells so as to maintain a reasonable level of fat stores? Then the brain started listening in? I don't know, but I find the idea interesting. And of course, the basic control of fat storage at that stage would then have been ETC derived superoxide. A little gets insulin signalling going. A lots shuts insulin signalling down. Insulin signalling, of course, is core. Even today. Final final comment. This post makes me sound like Ray Peat. Something I find very embarrassing, to say the least. *Wallang! Wallanga: You goin' in dat cave man? It's dark in there. We keep cows in there. We keep sheep in there. We keep pigs in there. Take care you don't step in no wallanga. It needs a guitar, a folk club and a very long shaggy dog ballad to get you to this punch line.